The alliance with the JD(S) in Karnataka could well tilt the balance in favour of the Congress in several closely contested seats. Bangalore: Former prime minister and Janata Dal (Secular) supremo H.D. 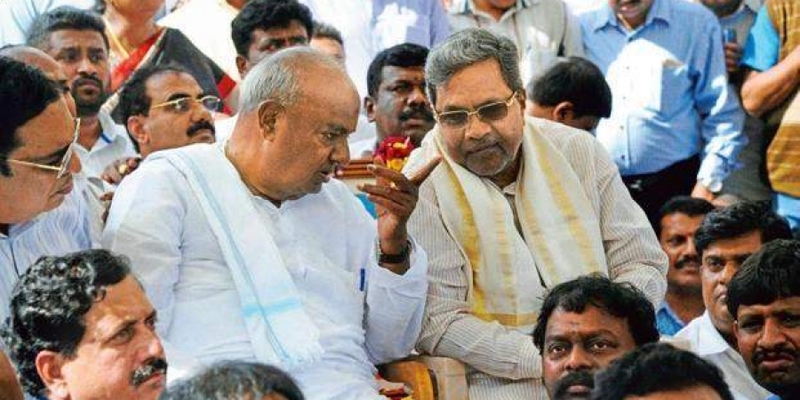 Deve Gowda is no stranger to melodrama on the political stage. Over the last two decades, he has often used tears and emotions to tide over political crises and keep his party together, firmly under the grip of his family. So it was no surprise when tears rolled down Deve Gowda’s face on stage in Karnataka’s Hassan last week, when he declared the candidature of his grandson, Prajwal Revanna, from the Hassan parliamentary seat. Prajwal is the son of the state public works minister H.D. Revanna. Deve Gowda has won from Hassan five times, including in 2014. Another Gowda grandson, Nikhil Kumaraswamy, son of chief minister H.D. Kumaraswamy, will contest from the Mandya Lok Sabha constituency. Incidentally, Mandya and Hassan were the only seats the JD(S) managed to win in 2014. Apart from reiterating that the JD(S) is firmly a family enterprise, fielding the two grandsons in 2019 is also a statement that this is the best election prospect for the JD(S) in recent times. Firstly, despite a depleted vote share and a reduced number of seats in the 2018 assembly elections, it was a windfall for the JD(S) as the Congress, desperate to keep the BJP out of power, conceded the chief ministership and a large amount of space to the regional party. Secondly, and more importantly, with the Congress as an ally, the JD(S) has virtually no challenger in its bastions. In seats like Hassan and Mandya, the battle traditionally has been Congress versus JD(S), with the BJP as a remote third. This is why the Gowdas are confident that it will be a cakewalk for generation next in these elections, and there is no worry about dissenting voices within the party. Undoubtedly, this will be the easiest election in recent times for the family. On the other hand, while the Congress-JD(S) seat-sharing arrangement in Karnataka may suggest that the Congress has conceded too much space to its ally, a closer look at the choice of seats allotted to the JD(S) and electoral history will reveal that the deal works in favour of the Congress as well. The JD(S) won only two seats in 2014 and polled 11% of the vote share, compared to the Congress’s nine seats with a 40% vote share. Even in the 2009 parliamentary polls, the JD(S) managed just three seats with a 13% vote share. However, in the last three assembly elections, the JD(S) has polled 18-20% of the vote. It was, in fact, at its lowest in the 2018 polls. This shows that as a regional party, the JD(S) is often squeezed out in a national election. More importantly, while at the grassroots level the JD(S)’s primary opponent is the Congress, the votes the JD(S) usually loses in a national election often go towards the BJP. Congress’s vote shares are similar in both assembly and parliamentary polls. So when the JD(S) does not have a strong candidate, the party votes seems to shift to the BJP in a national election. Now that the Congress is in alliance with the JD(S), it may be able to arrest the flow of votes towards the BJP. Also, despite its large vote share, the Congress by itself has not managed to cross single digits in terms of number of seats in the 2009 and 2014 parliamentary elections. In fact, even in 2004, the Congress won just ten seats compared to the BJP’s 18. The vote share difference between the two parties is only around 4%, but while the Congress vote is spread out across all 28 seats in the state, the BJP’s vote is concentrated in about 24 constituencies. In effect, Karnataka must be understood as a division of BJP versus Congress seats, and Congress versus JD(S) seats where the BJP has a marginal presence. Further, the BJP wins by a huge margin in a select set of constituencies, like Uttara and Dakshina Kannada, Udupi-Chikkamagaluru, Dharwad, Shimoga. It is seen as unbeatable in these seats. In this backdrop, seat sharing between the Congress and JD(S) needs to be classified into seats in BJP extreme strongholds, seats where the Congress has lost by smaller margins to the BJP, and seats where the Congress and JD(S) slugged it out. Among the eight seats given to the JD(S) by the Congress, four – Shimoga, Uttara Kannada, Udupi Chikmagalur and Bijapur – are in BJP extreme stronghold areas, where the chance of winning is considered difficult even as an alliance. In fact, in some of these seats the Congress finds it difficult to even find strong candidates. Among the remaining four seats, two – Mandya and Hassan – were already with the JD(S) and one, Bangalore North, was won by BJP’s D.V. Sadanada Gowda by a margin of over two lakh votes in 2014. However, the allies believe that together they may be able to stall the BJP in this urban seat. That leaves the Tumkur seat as the big sacrifice the Congress has made in keeping the alliance together. Congress had won this seat in 2014 and it is not clear why the party parted with it, despite fierce opposition to such a move. There is speculation that Deve Gowda himself may consider contesting from this seat, and that could be the reason the Congress parted with it. In terms of the larger picture, the Congress stands to gain a lot from the alliance in several seats in Hyderabad Karnataka and Central Karnataka. The alliance could well tilt the balance in favour of the Congress in a few other close-contest seats too. In effect, the combined vote share of the two allies could be close to 55%, and so the possibilities of gains for the Congress are much larger than for the JD(S). Given that the Congress by itself has not been able to beat the BJP in three successive parliamentary elections, the alliance was its only hope in 2019. Hence, the sacrifice it has made to the JD(S) by vacating even a seat like Mandya, where it lost by only 5,000 votes in 2014, could pay dividends in the larger context. The alliance could possibly reverse the trends of 2014 and bring the BJP down to single digits. As expected, there is fierce opposition from local Congress units to the seat-sharing arrangement, and this is pronounced in areas like Tumkur, Mandya and Hassan. In fact, in Mandya, Sumalatha, the widow of actor Ambareesh who had won from Mandya in 2009 on a Congress ticket, has decided to contest as an independent with the support of the BJP. But given that the two main opponents are together, dissidence may not matter in these seats. From a myopic, one-election point of view, Deve Gowda’s family and the Congress seem to be where they both want in 2019. But it’s not clear what price they have to pay for this alliance in the long term.